The Nobel Prize in physiology or medicine was awarded to three Americans Jeffrey C. Hall, Michael Rosbash and Michael Young who helped elucidate the rhythm of life, pinpointing some of the biological mechanisms that keep our internal body clocks ticking away. By studying the genetics of fruit flies, the three managed to isolate a gene, called period, involved in setting the body’s natural daily rhythm; Hall and Rosbash then showed that protein (“PER”) encoded by that gene works a bit like sand in an hourglass as it accumulates at night in cells and then breaks down and dissipates during the day, oscillating “over a 24-hour cycle, in synchrony with the circadian rhythm,”. Young then went on to discover two more genes, called timeless and doubletime, that also appear to keep the body’s 24-hour-a-day hormonal, blood pressure, and temperature rhythms in a healthy meter, as they orchestrate a dance of feedback loops, protein checks, and delicate adjustments. The circadian clock anticipates and adapts our physiology to the different phases of the day. Our biological clock helps to regulate sleep patterns, feeding behavior, hormone release, blood pressure, and body temperature. The biological clock is involved in many aspects of our complex physiology. We now know that all multicellular organisms, including humans, utilize a similar mechanism to control circadian rhythms. 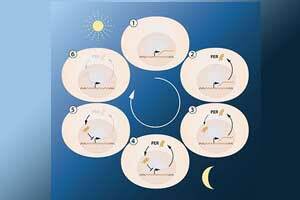 A large proportion of our genes are regulated by the biological clock and, consequently, a carefully calibrated circadian rhythm adapts our physiology to the different phases of the day as depicted in picture above. Since the seminal discoveries by the three laureates, circadian biology has developed into a vast and highly dynamic research field, with implications for our health and well being. 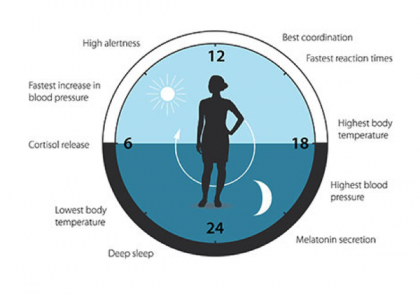 The circadian clock anticipates and adapts our physiology to the different phases of the day. Our biological clock helps to regulate sleep patterns, feeding behavior, hormone release, blood pressure, and body temperature. Circadian rhythm works best when there is regular sleep habit such as going to bed at night and waking up in the morning around the same time on all days, weekends included. Jet lag, daylight savings time, or staying awake can disrupt the circadian rhythm. Researchers are studying how shift work as well as exposure to light from mobile devices during the night may alter circadian rhythms and sleep-wake cycles. Irregular rhythms have been linked to various chronic health conditions, such as sleep disorders, obesity, diabetes, depression, bipolar disorder, and seasonal affective disorder.